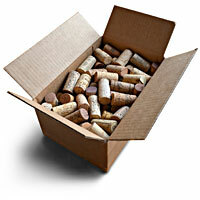 Recycled wine-corks sold on-line for crafters & hobbyists. Sale price 30% off! These recycled natural wine corks have been sorted to remove synthetic stoppers and champagne corks. They are great for use in crafts and hobbies. Sold in a box of 1000 (we pack by volume rather than counting and each box usually contains ~1050 corks). Box measures 12.25″ x 12.25″ x 12.25″ and weighs 10 lb. We ship your order using Canada Post regular mail service (2-9 business days). Sold in a box of 100 (we pack by volume rather than counting and each box usually contains ~110 corks). Box measures 9.25″ x 6.25″ x 4.25″ and weighs 2 lb. We ship your order using Canada Post regular mail service (2-9 business days). 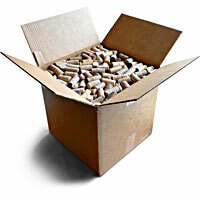 Because of potential complications clearing customs, when you buy recycled wine corks on-line, we ship to Canadian destination only. If you would like to purchase recycled corks and have them shipped to other countries, please email us and we can make arrangements. If you would like to pick up purchases at our Vancouver, British Columbia location, we can process your transaction without adding shipping costs. Please email us and we can make arrangements.